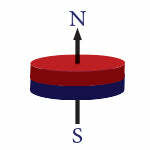 0.079" (2mm) dia x 0.039" (1mm) thick, N50 Rare Earth Neodymium Disc Magnet, Magnetized through the thickness. Nickel Plated. Gluing nickel coated magnets onto steel or plastic should be done with glue or epoxies specifically designed for magnets.